All the fuss about vegan this-and-that driving you insane? 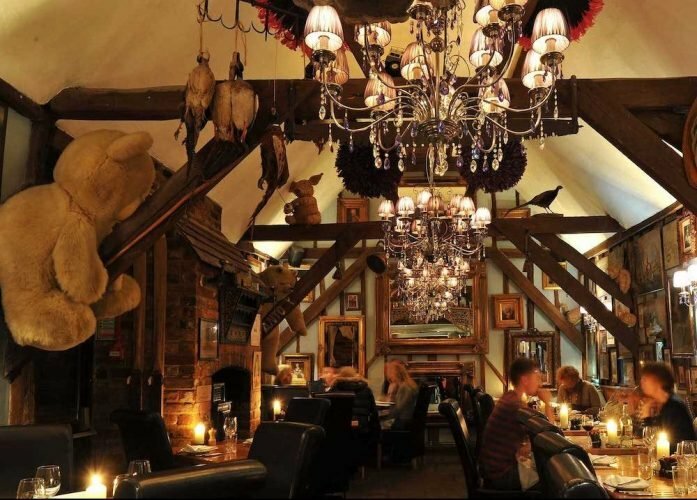 Get your chops around the meaty eats at The Chequers in Marlow. Bang in the centre of Marlow’s Georgian-fronted High Street (since the sixteenth century! 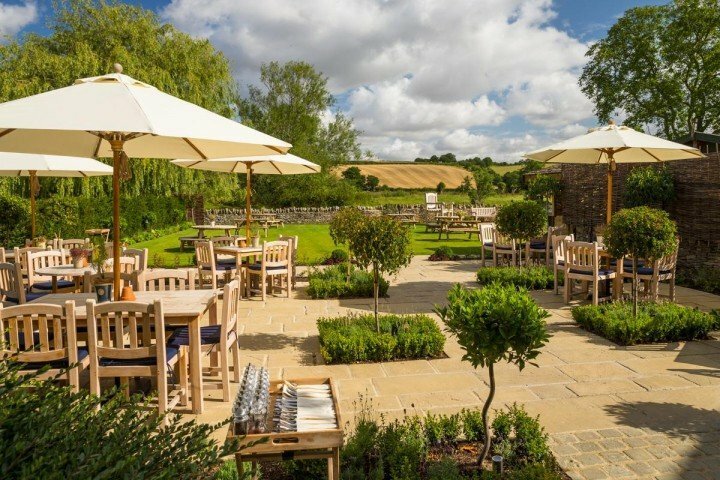 ), directly opposite The Ivy and just a stone’s throw from Tom Kerridge’s The Coach, The Chequers offers a more relaxed alternative to its fine dinning neighbours. Many people (myself included) disregard the pub because they are unaware of its charms. Enter Muddy. 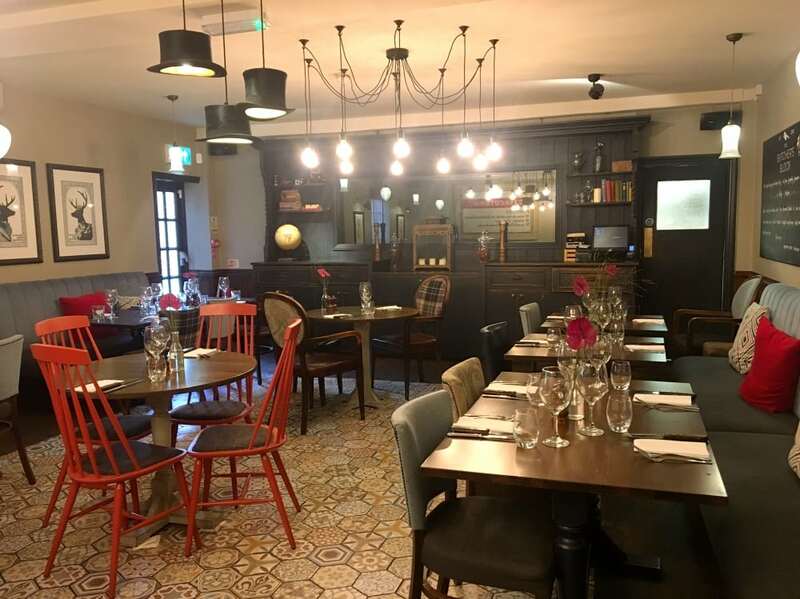 A new manager has taken over this year and really shaken things up; a refurb, updated seasonal menu and weekly quiz, gin and live music nights are just some of the changes he has made to transform this local’s boozer into a foodie destination. Don’t be put off by the blokes drinking their pints outside – it’s A LOT cooler than you would expect from its exterior. 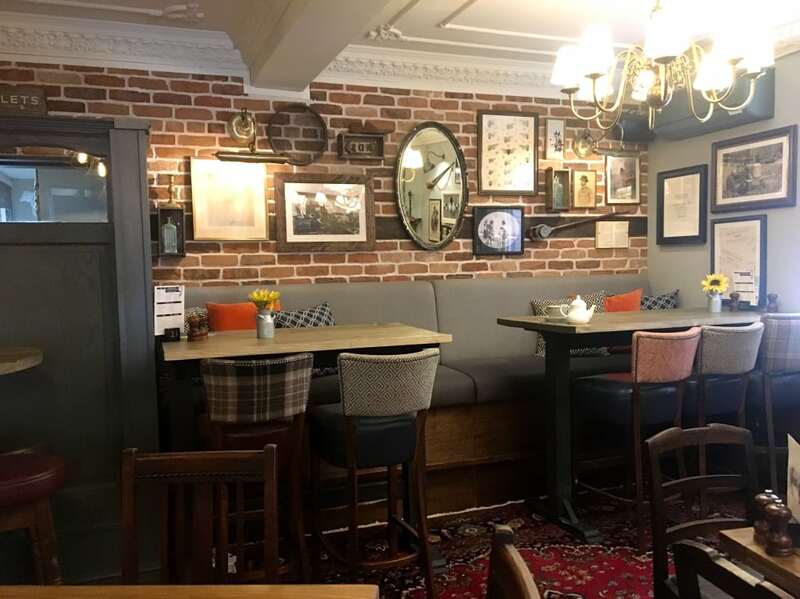 You’re welcomed by a classic brass bar with shabby-chic planks and a relaxed seating area ideal for after-work drinks. 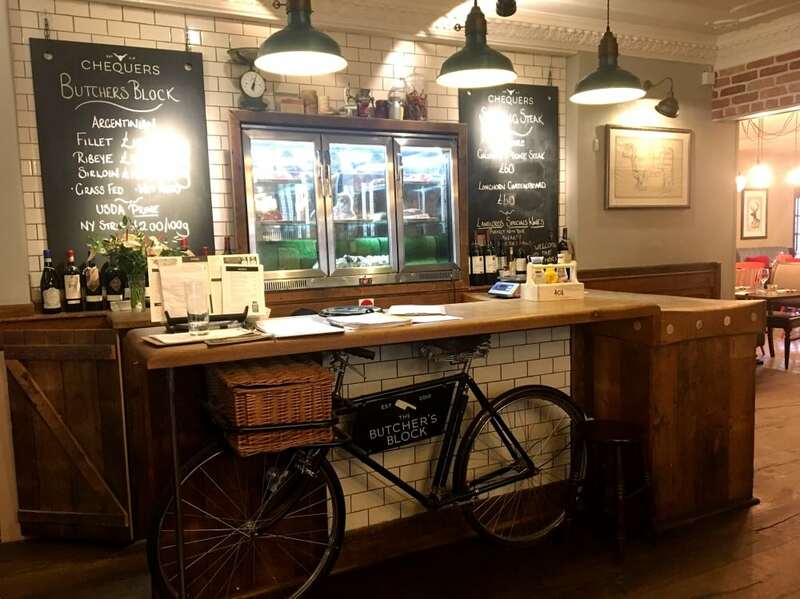 Turn left into the adjoining Churchill Tap (Marlow’s only craft beer haven) for a nod to history with original beams and Brakspears’ beers dating back over 500 years. Basically if you like the amber nectar, you’re in luck here. Further into the the heart of the building, the dining rooms have a pleasant mix of the old and new with two additional snug eating areas. The homely middle area plays with tradition, with exposed brickwork, mixy matchy upholstery, a grand fireplace, memorabilia scattered on the walls and Persian rugs. I can imagine tucking into a lovely roast here in the winter, so I will definitely be back to try their Sunday carvery (yes people, they’re making a comeback! ), utilising the theatrical centre piece of the huge butcher’s block, below. The bright and airy room towards the back of the pub where I ate (below) is more suited for hot days as it was mercifully cool in late-July. I loved the hexagon tiled floor, quirky wall art, industrial bare-bulbs and a charcoal, red and black colour scheme which gives it a modern edge. Cool hanging top hats too! 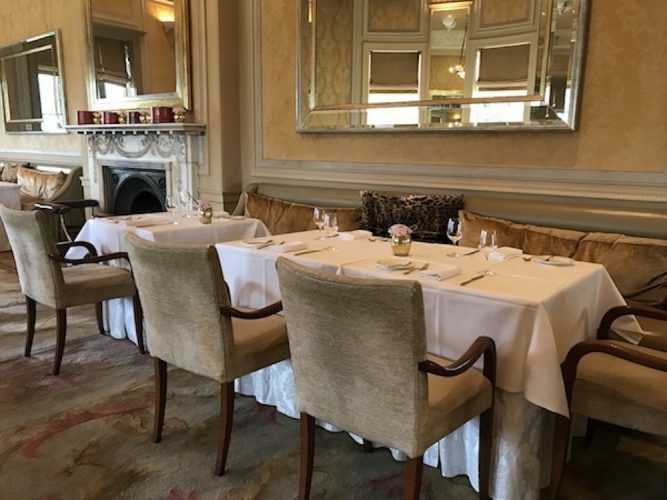 The Chequers was reinvented as a meat specialist a couple years ago and no question that its British menu of steaks, burgers and fish and chips is a crowd-pleaser. 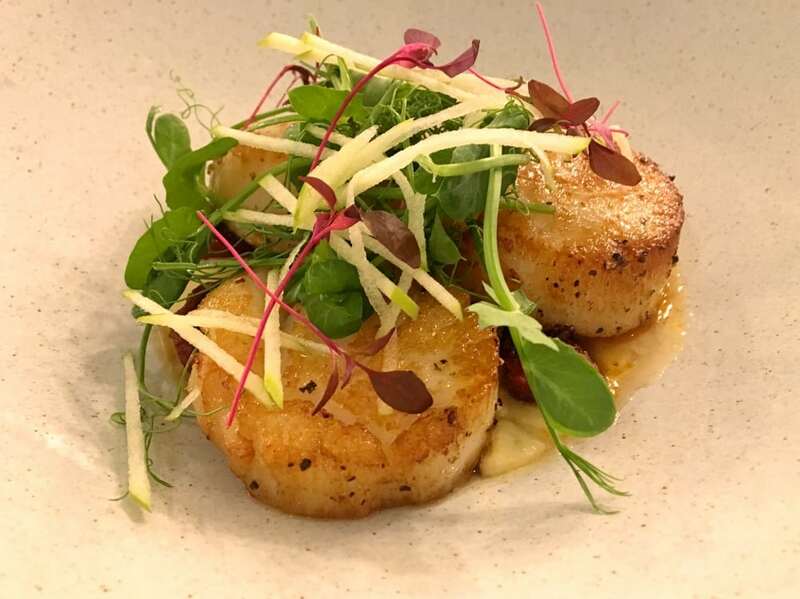 I started with three HUGE pan roasted scallops with Granny Smith apple, chorizo and celeriac puree whilst my date for the evening – my 12 year old brother – attacked some perfectly crisp Buffalo BBQ glazed wings (the philistine was fascinated by the hand cleaning bowl that came with it). 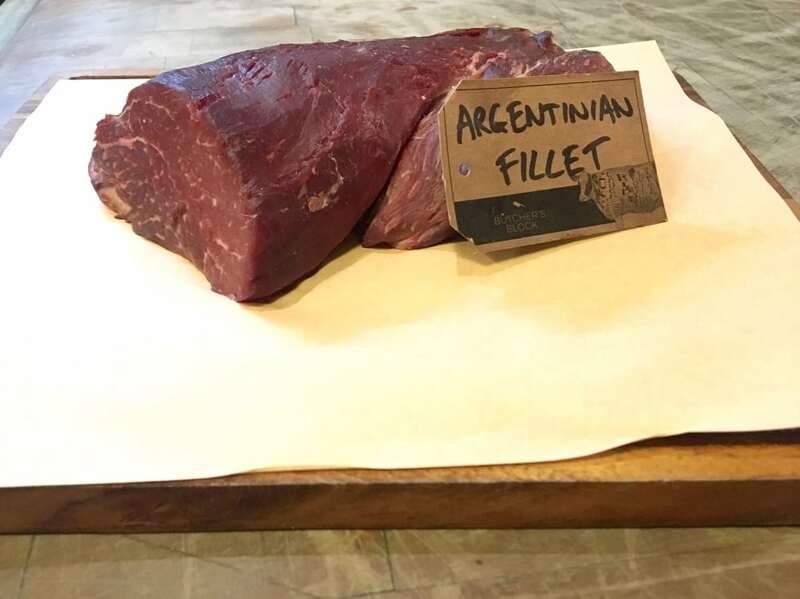 For main, I headed over to the meat fridge where the informed waitress explained all the different cuts and helped me pick the ‘wet-aged’ Argentinian fillet steak(wet aged is different from dry-aged in that they are vacuum-sealed to retain moisture – who knew?!). 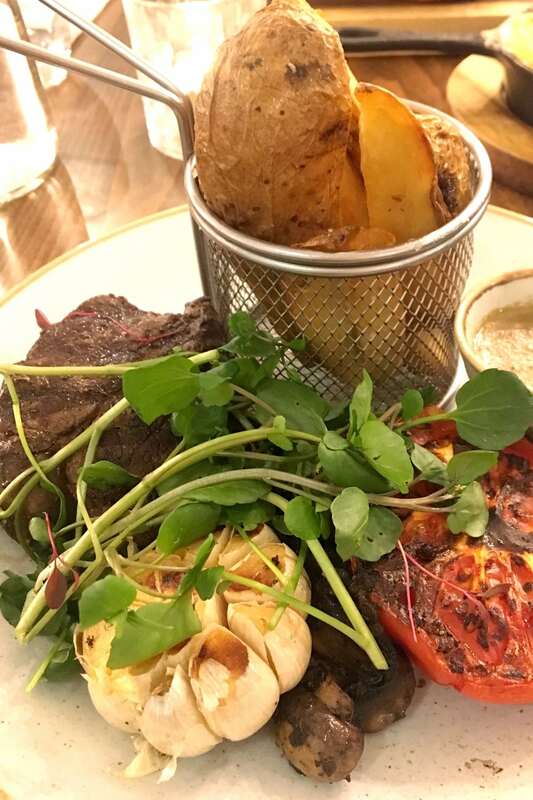 This was then cut to size in front of me and cooked to order, brushed with bone marrow butter and served with roasted confit garlic, mushrooms, a merlot and pink peppercorn tomato, watercress and triple cooked chips. It was easily the most delicious steak I’ve ever had (even beats a £60 one from Gaucho) and I heard neighbouring diners say the same thing. The meat was so tender it melted in the mouth and had enough flavour to be enjoyed on its own so I used the fluffy chips to mop up the peppercorn sauce. My brother had the grilled chicken BLT burger with smoked streaky bacon, tomato, lettuce and saffron aioli in a signature bun accompanied by skin on fries. He thought it was a bit dry (probably because he scraped all the healthy stuff out) but went nuts for the mac n cheese side. A blueberry cheesecake with blueberry gel and gin macerated blueberries (they had me at gin) was slightly over-set but ended the meal on a refreshing note. Take advantage of Marlow’s smart retail offering including Mint Velvet, Winser London, Jigsaw and Whistles. Interior mecca Home Barn is a short drive away and full of vintage and retro furnishings beloved by London stylists . Or head down to Higginson Park for an icecream and play park and further on to the river for a stroll in the sunshine. Good for: Carnivores! Meat is the star of the show here but there is also a lot to love for families (there is a kids menu), hungry shoppers and craft beer enthusiasts. Not for: Die-hard veggies. Although there are more meat-free options than last time Muddy visited, it’s still not extensive. The damage: Meat is a bit pricey at £15 per 100g, but worth every penny. 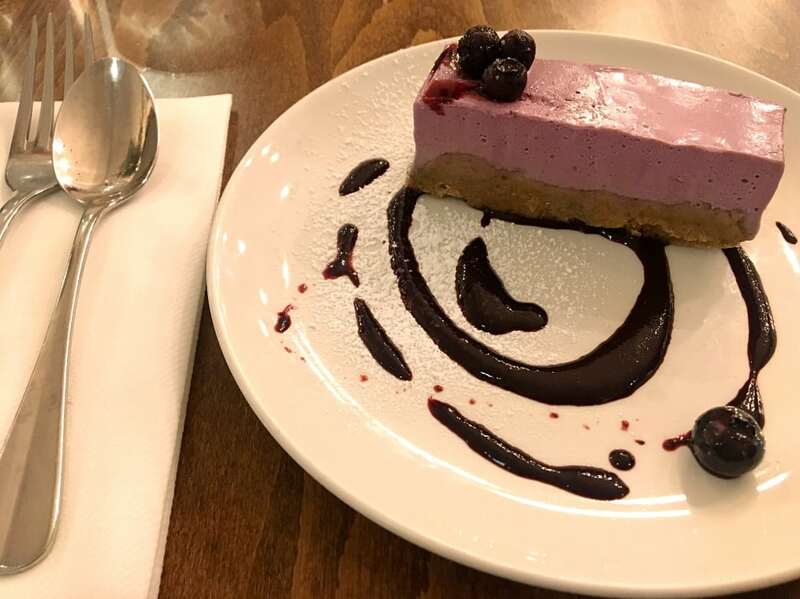 The rest of the menu is more reasonable with small plates starting at £5.50, mains ranging from £13 for a chicken burger to £16.50 for guinea fowl and desserts all around £6. They also serve a carvery from the Butchers Block on Sundays for £16.95. 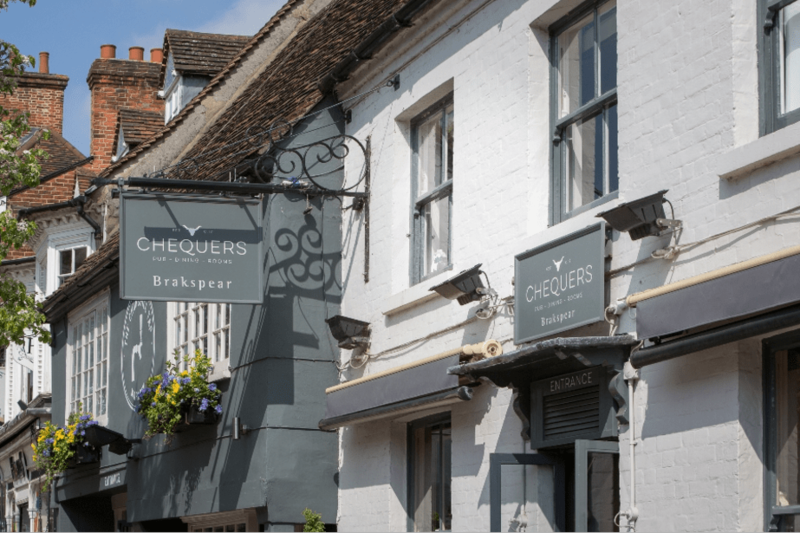 The Chequers, 53 Highstreet, Marlow, Bucks SL7 1BA. Tel: 01628 482 053. Still hungry? Take a look at more Pubs in our Fun Finder. 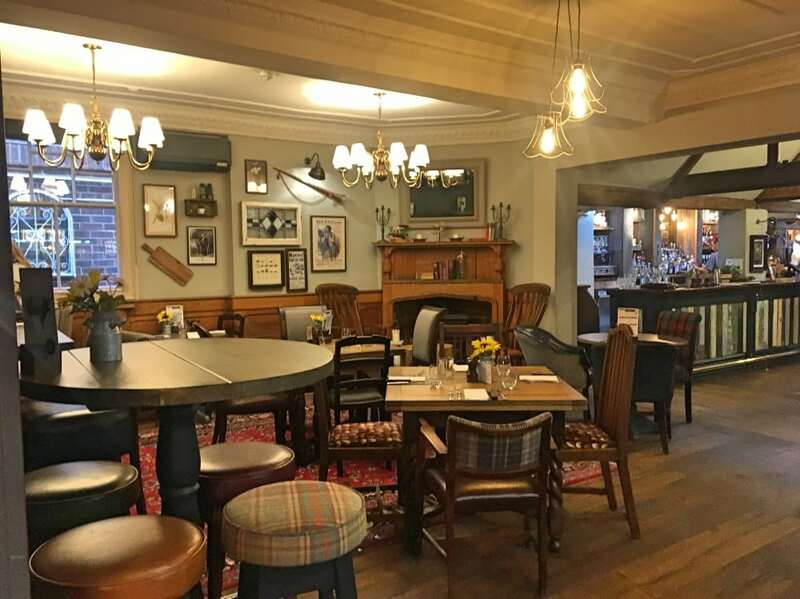 This place sounds great just what my husband and sons like – they are big meat eaters and partial to a drop of real ale! My mouth was watering so much as I read the article that I’ve booked a table for 6!